Chameleon Reversible Thermochromic material is a combination of Leuco Dyes (also known as Colour Formers), Colour Developers and Melt Materials that are all blended together and then microencapsulated. This produces an aqueous slurry or concentrate before they are finished into their final form of a Label, Ink or Plastic component. 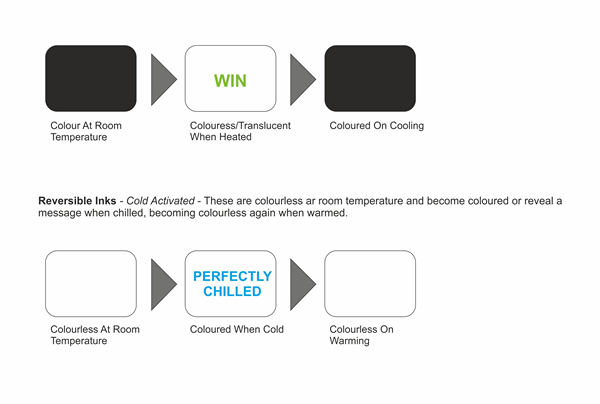 These products all change from colour to colourless as the temperature rises and with decreasing temperature the colour returns. Leuco dye is commonly used in manufacturing and process control, advertising, consumer packaging, product labels, security printing, novelty applications such as temperature sensitive plastics and mugs,promotional items, toys and textiles. Irreversible Inks – Thermochromic permanent change inks are a high temperature activated, permanent change pigment used in manufacturing processes such as metalworking, annealing, welding and riveting for quality purposes.